Building on Stevenson’s hugely successful Just Mercy, Lynch’s national platform at the Justice Department, Ifill’s role as one of the leading defenders of civil rights in the country, and the occasion of Thompson’s launch of a new center on race, inequality, and the law at the NYU School of Law, A Perilous Path will speak loudly and clearly to everyone concerned about America’s perpetual fault line. A probing, provocative conversation on the national narrative in the Trump era. . . Exactly the book we all need right now. 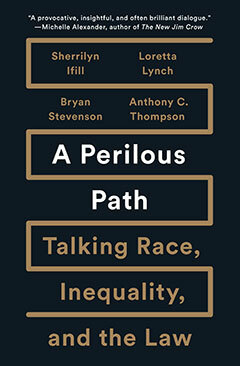 A Perilous Path is a roundtable of four of the best civil rights minds in the country discussing their work, their lives, and the fight for justice that we need at this harrowing hour in U.S. history. Sherrilyn Ifill is the president of the NAACP Legal Defense Fund, based in Washington, DC, and is a co-author, with Loretta Lynch, Bryan Stevenson, and Anthony C. Thompson, of A Perilous Path (The New Press). Loretta Lynch was the eighty-third attorney general of the United States and lives in Washington, DC. She is a co-author, with Sherrilyn Ifill, Bryan Stevenson, and Anthony C. Thompson, of A Perilous Path (The New Press).